After nearly two years of leaving my desktop and a 3 monitor setup behind, I’m back to 3 monitors + 1, four screens in total, all running from my MacBook Pro. My My Multimonitor Setup: Three Screens For One Computer post explains how I used to run three monitors from my Windows XP desktop. When I made the leap to a MacBook, I had only one external display port — so I could only run one external monitor. That’s been OK for the most part. 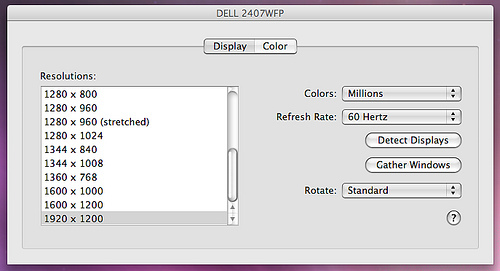 My external monitor was a big Dell 24″ widescreen running at 1920×1200 resolution. I’d usually use it for running my Windows XP installation on my MacBook “up above” with my Mac programs (usually just Firefox) running “down below.” My Mac & Windows Under VMware – Awesome! post has more about this. Still, it has felt cramped at times. I’ve missed my three monitor setup and have even pondered leaving the Mac entirely to get back to it. I knew there were some solutions for the MacBook, because I’d explored some options early on, as outlined in my Multiple Monitor Solutions For The MacBook Pro post. But I just never got any of them going. 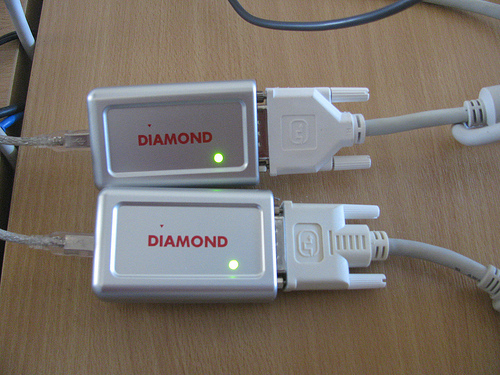 My solution was to go with a Diamond BVU195 USB-DVI adapter. The box said it worked with Macs and could drive the resolutions I wanted. So I purchased two of them – $70 each, $140 total versus $340 for the Matrox box. As for my middle monitor, I plugged that directly into my Mac’s built-in external display port. And? And nothing. The Mac didn’t see them. And the CD-ROM enclosed didn’t have any drivers. And the sparse printed instructions didn’t mention the Mac at all. Dammit. But there it was on the box. They were supposed to support Macs. So I went back to online product page (that I linked to above), found the support area and downloaded the drivers that clearly said Mac OS. And got nothing. No drivers. However, there was another sparse manual in what I downloaded that mentioned Mac support — saying to get the drivers from the DisplayLink site. Well, I didn’t even know what DisplayLink was. I guess it’s a standard for multiple monitor support. So I headed over and found the Mac page. In turn, that sent me to a forum page where, if you scroll down to the very bottom, you get the latest driver. Not very reassuring. And yet, it worked. It worked marvelously. 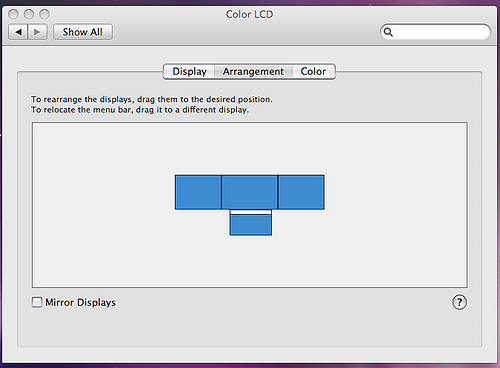 Once the drivers were installed, and I rebooted, my Mac saw my two additional monitors. 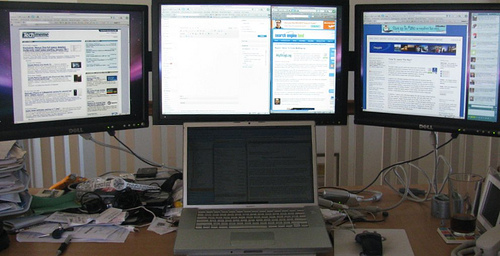 I had three external monitors running in total, plus my laptop display (1440×900 resolution on a 15″ screen) as well. I can arrange them however I’d like. My current setup is shown at the top of of this post (and shut up. I know my desk is a mess. Let’s not even get into how in doing all this, my laser printer fell on the floor and now probably has to be replaced. Don’t. Go. There). I wish you could put the dock on an external monitor, but I haven’t found a way to do that. So far, the monitors run great. The two through the USB adapters feel ever so slightly sluggish — really not that noticable, and I’m pretty happy. I did find that Skitch, my screenshot application for the Mac, crashes if I try to shoot using the USB monitors. But so far, that’s the only glitch. I briefly tried testing whether I could link either of the USB adapters to VMware, so that I could extend my Windows desktop to them. That kind of freaked out my monitors. I might play with this more later. But if use use Unity mode in VMware, then you can put a Windows application on any of your monitors, not just within the one running Windows. Of course, I find Unity mode to be sluggish — but I might play with that more, also. Meanwhile, I still debate the PC versus Mac choice. 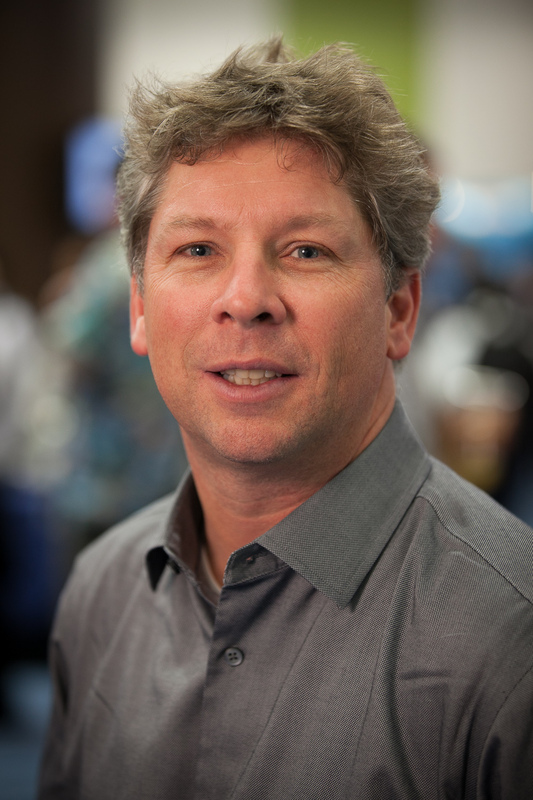 If Mac made a laptop with an Intel i5 or i7 quad processor, problem completely solved. I’d feel I had enough horsepower to run both operating systems super well. But VMware on my existing MacBook still does the job pretty well, and this solves the other major issue that was making me think I needed to jump to a desktop — more monitors. 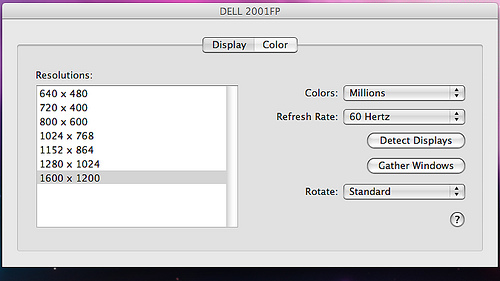 Another wish would be if Mac simply made an iMac in a 24″ size that had i5 or i7 processors. 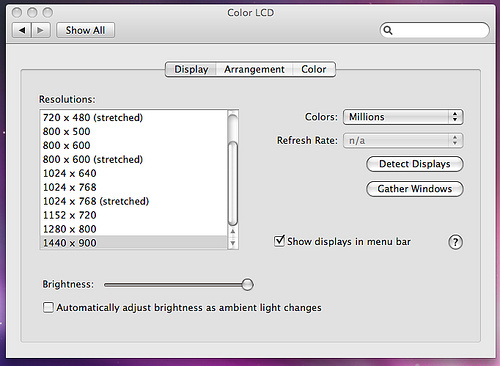 That’s only possible for the 27″ iMac — and that’s simply too big. For me, it wouldn’t allow room for monitors on either side, and I don’t want one monitor on just one side, as I find ergonomically, it helps to move my head all around. Really, my MacBook setup is great. I get my email right in front of me on my laptop screen, “down below.” I’ve got room to read and write within a browser directly in front. And I’ve got monitors giving me room for additional reading or other tasks to either side. I just want more power! For more on what I’ve written about multiple monitors, especially tips on using them in Windows, see my Multiple Monitors archives.